Did you know that you now have one more reason to join the Save A Lot Smart Shopper Club? Beside the fact that you will receive access to a cartful of benefits like latest specials and deals delivered straight to your inbox, tasty and affordable recipes recommended just for you and the ability to rate and review products on Save-A-Lot.com, you could also win a gift card! That’s right! 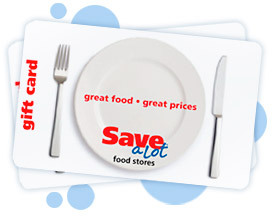 Simply sign up for the Smart Shopper Club at Save-A-Lot.com/SmartShopper and be entered into a Monthly Drawing for a chance to win a $100 Save-A-Lot gift card! It’s that easy! From Sunday, August 2, 2015 to Monday, February 1, 2016, fill out the entry form in its entirety and submit to receive one entry into the applicable Monthly Drawing. You are allowed to enter one time per month so be sure to return next month for a new chance to win! Please note that each Monthly Drawing Period starts at 12:00:01 a.m. CT on on the 2nd day of each month and end at 11:59:59 p.m. CT on the 1st day of the following month. The Save-A-Lot Smart Shopper Club Online Sweepstakes is open to legal residents of the fifty (50) United States and the District of Columbia who are at least 18 years of age as of the date of entry. I love save a lot and it saves me lots of money. I’m not interested in Publishing Clearing House Sweepstakes, but I do enjoy shopping at the Save-A-Lot stores I always save money every time I do my grocery shopping. And their meat selection is far greater than Hyvee or Wal-Mart by far. ALWAYS enjoy shopping at our Save_A_Lot store. I had NEVER been in one until I moved here. I am constantly”bragging” about OUR Save_A_Lot as if it were mine! Very friendly associates and a terrific manager. Thumbs up! Also, everyone in the area comes here for the meats!!! Please send your weekly Milwaukee,Wi. ads to my e-mail. Thankyou!